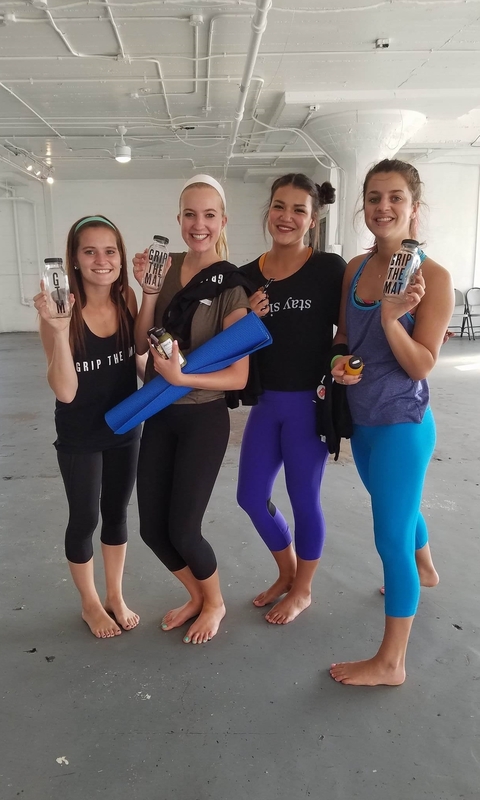 June 25th, 2016 - Grip The Mat hosted a free yoga social event in memory of Pulse victims. Yogis joined together in the light-drenched Downtown LA loft The Lazarus Experience for a heartfelt vinyasa flow lead by GTM co-founder Christy Skarulis. After the yoga, a relaxing social hour with lively music, local fresh-pressed juices by Juice Served Here, delicious vegan cookies by Erin McKenna's Bakery in LA and a variety of mouth-watering KIND bars brought the mindful event full circle. In addition, attendees had the opportunity to sign up for an appointment with the Red Cross to donate blood at this special donation-based event. Grip The Mat stands by the people of Orlando: "After we started the company in Washington, DC, the first city we brought our events to was Orlando. We host yoga social events to bring people together in a welcoming, exciting and safe space. We accept yogis of all levels of experiences, all shapes and sizes, all sexual orientations and all religions," co-founder Christy announced. Thank you to those who donated at the event! 100% of the proceeds go to the OneOrlando Fund. More Grip The Mat LA events coming soon! Want to see what Grip The Mat is all about for yourself? Sign up below and be the first to know about the next GTM event near you!